The blood that unites us is thicker than the water that divides us. The world has been induced by the labor of African slaves. Africans have contributed to the foundation, history and the construction of various nations, often replacing european and indigenous laborers who fell ill. The strength of the African continues to salt the earth. Due to this systematic institution of the past, today there still remains African descendants scattered abroad and beyond. Take a journey with AAL through pan-Africa by clicking on the links below. You'll soon find that the flavor of African heritage continues to season the globe. Throughout this site, "African" refers to those of African descent. Poem excerpt by Sherehe Yamaisha Roze: "Somos una gente" click on title to view full poem. Africans in Cuba: Both the Cuban Government and the CIA Fact Book state that Cuba's population of African descent is around 62%. This may well be an undercount. Much of the controversy in these figures, when they are debated, stems from the Cuban approach to racial categorization, which in turn derives from Latin culture. Mulatos are counted separately and are not counted as "Black" so there is a tremendous undercount. There was a great deal of mixture in Cuba so mulatos are numerous. Africans in Argentina: The generally accepted theory is that in the mid-1800s, African slaves were brought to Argentina and began to influence the local culture. The word "tango" may be straightforwardly African in origin, meaning "closed place" or "reserved ground." Africans in Costa Rica: Blacks on the Caribbean coast tend to be Protestant, and there is a sprinkling of other denominations in San José, including a small Jewish community. Spanish is the official language, though English is understood in tourist areas. Many Caribbean blacks speak a lively dialect of English, known as Creole. Indian languages are spoken in isolated areas, primarily Bribri, which is estimated to be understood by about 10,000 people. 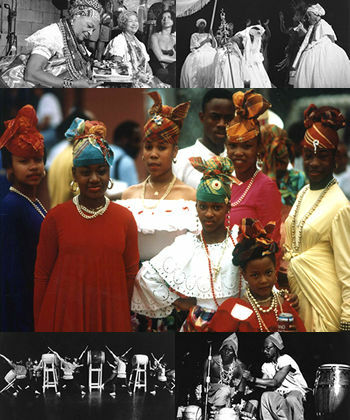 Africans in Panama: With the exception of Belize, Panama is the Central American nation with the strongest historical links to Africa and the Caribbean. The first link comes from the long history of African slavery in Panama, although the number of slaves was small by comparison to Caribbean plantations. The second link and the most important comes from the thousands of West Indian immigrants. These peoples came for the building of the Panama railroad and canal, giving way to the modern Panamanian working class. Chronological History of Pan-African Slavery: This page contains a detailed timeline of the main historical, literary, and cultural events connected with British slavery, abolition, and emancipation between 1400 and 1500. It also includes references to the most significant events taking place outside of the British zone of influence (in the fifteenth century that was most of the world) as well as some key events in the history of European exploration and colonization. both African America Artists and African American History. The website contains 1000's of links and 100's of Slave Narratives and full text of historical literature. Please explore the site and share with anyone who migh be interested. The primary aim of this website is to encourage research activity on people of African descent and to provide information to the study of the African Diaspora. A historical perspective of a nation, its people, and its cultural evolution. Please make sure to look through the 1000+ Slave Narratives on my website. Many of the colored soldiers from the Revolutionary war are true heroes so take a look at the images of them as well as the other colored soldiers throughout the 18TH 19TH AND 20TH CENTURY.